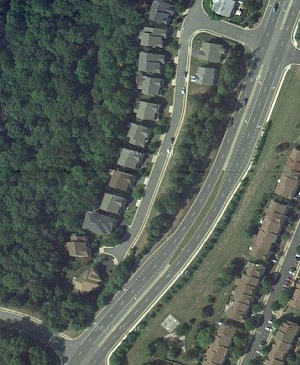 We live at the end of a road that contains a sixteen-house subdivision. The houses were built in 1996, so the houses and the street are sixteen years old. Earlier this year, the homeowners’ association of our subdivision announced that sometime this summer, the street was going to have to be resurfaced. This was going to mean that for two consecutive days, we could not get our cars in and out of our driveways, and we could not use our street. Nobody bothered to tell us any dates, but we knew it was coming. When I heard about this, it didn’t seem like a big deal. I often go for four or five days at a time without leaving the house, and I figured that two days would go by without any trouble whatsoever. That’s what I get for assuming things! Last Monday, when Fluffy and I were leaving home to go to a family home evening dinner, we got a flyer that announced our street would be closed two days that week. So much for advance notice! As Murphy’s Law would have it, I had six (count ‘em!) doctors’ appointments between Monday and Friday, and Fluffy had a dentist’s appointment. This was in addition to going to the temple, which was also one of the days in question. Fortunately, Fluffy has a gift for turning a crisis into an adventure. He assured me that we were going to make it to our appointments and to the temple with barely a blip on the radar. I didn’t believe him, but I was at least willing to give him the benefit of the doubt. Our house at the end of the street. The forest behind it was the setting for our adventure. When the first morning came, our driveway was blocked by 7 a.m. Fluffy had taken precautions and had parked one of our cars on the street directly behind our house, and he assured me that we were just going to take the wheelchair and zip me the fifty yards or so to the vehicle. When he told me his plan, the first thing I thought was, “ARE YOU OUT OF YOUR EVER-LOVING MIND?” My wheelchair, which was chosen for cost rather than for function, can barely go over a seam in the sidewalk without bouncing me out. Our backyard is a rooty forest that has never been graded or grassed, and there is no flat place anywhere. This was a plan that was doomed to fail. For some reason, I didn’t say what I was thinking. So at the appointed time, Fluffy took the wheelchair around to the backyard and waited for me at the foot of the deck. This was a major undertaking. I had probably not been on our deck for five or six years, and the only time I ever went into our backyard was the first spring after we moved in, back in 2003. I’ve probably been through the Panama Canal twice since I was in our backyard. For someone like me, our backyard is less accessible than Outer Mongolia. I got to the foot of the deck, and Fluffy seated me in the wheelchair. Between the lumps and the roots in the yard and the wet ground from recent torrential rains, he couldn’t move that wheelchair six inches when I was in it. This was a real I-told-you-so moment. (No, I didn’t actually say, “I told you so,” because I hadn’t told Fluffy what I had been thinking.) But I had no choice; I had to go to the doctor. So I headed toward our car on foot, with Fluffy holding my hand and dragging the wheelchair until I had to sit down and rest. I was really surprised at how well things went. After resting at the foot of the stairs, I only had to stop and rest two more times. The first time was when we got to a barrier of volunteer trees that were obstructing our path. While I caught my breath, Fluffy went back to the house for some pruning shears to chop down the saplings so we could pass. As I sat there, it was as though I was in another world. The ground was carpeted with husks and shells from last year’s black walnut crop. The local squirrel population had carefully removed the nutmeats, but the husks and shells provided a decaying cobblestone-like surface. The wet earth and the rotting foliage made the yard smell like the forest primeval. The cicada chorus was so loud that I could barely hear the passing traffic on the adjacent parkway. I wished I could have a recording of their song to play when we go to sleep at night. They sang as if there was no tomorrow. Who knows? Perhaps, for them, there wasn’t. When I looked up, I was met with an amazing sight. The canopy of leaves was overhead, but sunlight shone through the leaves and made the world above me brilliant with light. The greens of the leaves and the blue of the sky were so spectacular that I wanted to take pictures, and then have those images painted on our bedroom ceiling. It would have been beautiful. When we came home, Fluffy dropped me (in the wheelchair) off at the head of our street while he went off to park the car. Then he picked me up and rolled me downhill toward home. All I had to do was hike up the driveway, and we were safely inside. The doctor was visited, and life was good. I had been so angry to have to make this trek, but the silver lining turned out to be so pretty that I didn’t mind the cloud. I felt so accomplished to get to the car and, later, up the driveway, too. It wasn’t quite like summiting Mount Everest, but maybe it was the Kathy equivalent of Mount Kilimanjaro. Altogether, what could have been a nasty experience turned into a memorable adventure. Life is like that. There are always setbacks, and if you focus on the setbacks life can be pretty miserable. But along with the setbacks, there are hidden blessings. If you look for the blessings, they are always there to be found.